Vronos, Elite Inquisitor, steadied his silver-chased crossbow and took aim. The blessed bolt snapped away and dove with a spray of gore into the heart of the accursed one. The woman dropped without a sound. Beside her wailed a child barely old enough to walk. It crawled over to the still breast of its mother, whose life blood still mingled with the village mud. The sinners would find the Blessed Sleep there, their evil as dead as their cursed flesh. Vronos issued his orders: some to heap the corpses in the village square, others to bring wood and oil for the final purification. The children, though, might still be saved. As the others went about their grim tasks, he led a group to gather the crying babes and the dark-eyed waifs from their parents' cold sides, and the hollow-cheeked, resentful youths from the darkened huts where they huddled. He chose the gentlest faces, the most soothing voices from among his toughened monster-killers. There were not many. But, gradually, they brought forth all the trembling children. The tired hunters guided them to the nearby campsite, while the sky grew lurid with the consecrated fire. Unfortunate that innocents must suffer in the cleansing. Vronos felt a pang, remembering a night long before. The flare of the greasy fire, the stink of charred wood, pitch, and boiling blood. His sister's gurgling screams. The hooded men and women had tried to tell him the fire would purify her soul. That she would find the Blessed Sleep. He had not understood. He didn't know why sleeping seemed to hurt so much. They had taken him to the crèche within the cathedral where the children of the cleansed were raised by the Order of the Silver Heron. The gentle, cloaked attendants had nursed him, kept him fed and clothed, taught him to work in the gardens, to tend the animals, and to pray. They did all of this with hardly a word, although Sister Alina hummed songs from her Stensian home as she went about her chores. As he grew older, he learned the discipline of the cathars. He trained in all the weapons of the pure. He studied all the lore of the monsters that haunted his world. He taught himself to be hard. Although the village was cleansed, the countryside was still dangerous. Vronos established watches for the night, but for the sake of his exhausted followers he kept each shift's length and number of watchers as small as possible. He, of course, insisted on the first watch. When it was his turn to rest, he was asleep almost before he hit his bedroll. Vronos rarely dreamed. But that night his slumber was troubled by terrible visions, mixed with bestial cries and human screams. A terrible weight crushed his chest. He thrashed and moaned, then woke to a blaze of pain. In the guttering firelight, Vronos looked up into the eyes of a blood-crazed beast that snarled and clawed at his leather jerkin. It snapped at his face and tore a strip of flesh from Vronos's brow and cheek. Blood frothed around its muzzle. Vronos roared and threw himself upright, knocking the monster off him. His own blood drowned his vision. He could hear it scrabbling, readying another attack, but Vronos found the hilt of his sword and brought it up in a scything arc. The blade shivered as it cut into flesh, and the weight of the brute fell away. He leapt to his feet, wiping his bloodied face, and tried to make sense of the situation. Around him sprawled the bodies of his loyal troops, as rent and mangled as their ripped bedrolls. A few groaned weakly from torn throats. In the vile moonlight Vronos saw the hunched, bristling shapes of the wolf-things clawing at the few of his soldiers who yet fought. He looked down and saw a girl lying still at his feet. A deep gouge had gashed through her shoulder, deep into her chest. Her mouth was smeared with blood, and a shred of meat still hung from her reddened teeth. Vronos looked up again. The savage shapes were smaller than men, their movements ungainly. Sickness crawled into his throat. Vronos yelled wordlessly and charged the nearest beast. He thrust his blade into its neck, not stopping to be sure it was dead before moving to the next. Another slash and another body fell away as he stumbled through the corpse-field. 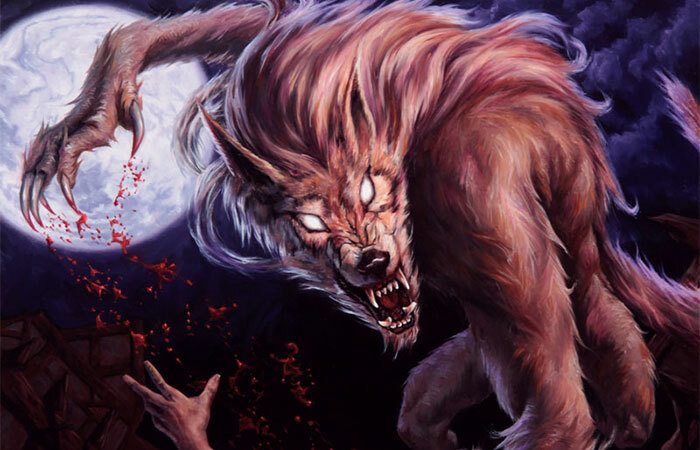 Howls erupted from the monsters, mingling horribly with the cries of the dying soldiers. The pack turned to him. He stood alone amid the growling child-weres. One leapt for his throat. Vronos was standing in a vast space. Beneath him was cold metal; around him glass. Above him swirled leaden clouds, but cool light shone down through a circular opening within. It formed a pool in whose midst he stood, immersed in murmured intonations—or prayer. Vronos stared around him. He saw glimmering shapes drifting in a great bowl. Beings floated amid them, some unrecognizable, as well as forms more human. Metal glinted from all their faces. A bald, blue figure moved into his view, staring back at him expressionlessly. The creature's face was ageless, lined with delicate silvery filigree. It had no neck. Twisted metal somehow held its head in place. It scrutinized him wordlessly for a few seconds and then turned toward the other observers. It spoke in a flat voice. "This specimen is imperfect. Perhaps it was damaged in the transition. It should be expunged from the study." "Cleansed, do you mean?" Vronos drew himself up as proudly as he could. He looked around at the cold faces. "By what standard do you judge my purity?" The blue one returned its gaze to him and blinked, once, twice. "This one is new to its abilities. This one might be of value. We have not seen one such since the Knight." 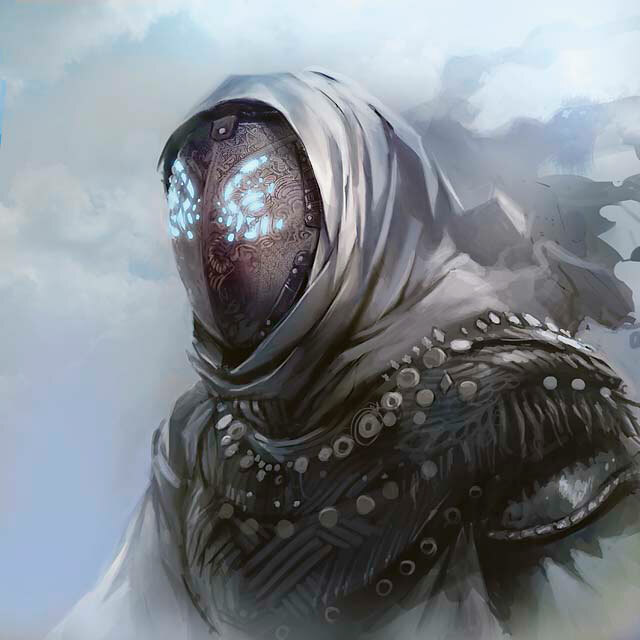 He had never before heard of Planeswalkers: people like himself who had somehow learned to travel between the disparate worlds that made up existence. But these strange scholars, who named themselves the Ethersworn, had long studied such travel. They postulated that the mysterious metal they called etherium could tie living beings more strongly to the sea of energy in which all the planes floated. 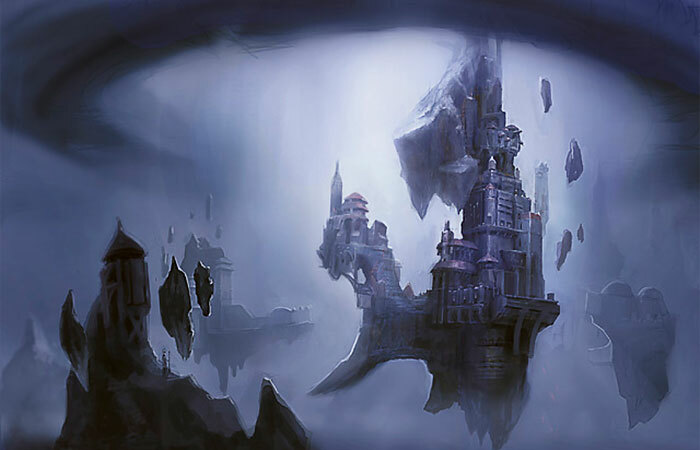 The blue beings, vedalken, even replaced large amounts of their flesh with the substance. But the secret of traveling through the Æther, as he could, was beyond them. They pored over their Twenty-Three Texts, as holy as any Avacynian hymnal, for the key that would unlock the mystery. But nothing was more valuable to them than the chance to observe a real Planeswalker in a controlled setting. Vronos obliged, but demanded a high price in return: knowledge. He uncovered some of the lore within the sacred Texts, learned the basic nature of the strange metal and its long-lost creator, and practiced the arcane arts of these metal-working wizards. 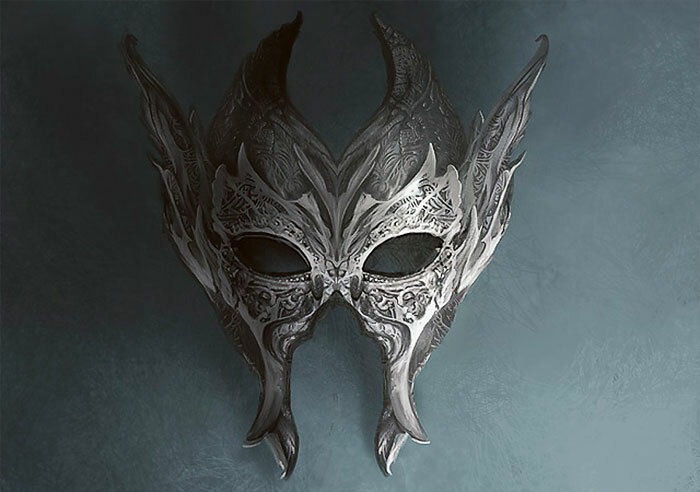 He repaired his ravaged face with an etherium infix and crafted a filigreed mask of the same material. Between these lessons, he planeswalked. He threw himself into the maddening spaces between the worlds and learned to find the subtle paths that led him to new places. He strolled shores lapped by liquid fire and stood on peaks so high they almost touched the stars. He paced through the streets of an endless city. He saw bizarre creatures that could shift their bodies into a variety of forms. He wondered at the blazing breath of dragons, chased alien beasts through world-forests, touched gems that seemed alive. And he reported to the eager scholars—but not all that he learned. Vronos collected nuggets of knowledge and hoarded them behind his mask, along with his disfigurement. With metal and lore, he honed his planeswalking skill and discovered how to track others like himself by the faint trails they left in the Æther. He returned as a penitent, after many months of study and travel. He knelt in the hall of the cathars in Avacyn's great cathedral and offered up his prayers to the angel. He had expected no less than excommunication, even death, for his transgressions. But Avacyn bent her glorious face toward his bowed form, infinite love brimming in her eyes. She kissed her maimed servant's brow and spoke words of forgiveness and understanding. For the first time since that terrible night, and for the last time, Vronos's heart twisted with raw emotion. He pledged himself anew to her service. He begged her to task him with the most dangerous quests. He swore never to let weakness prevent him from doing what was needed, no matter how harsh. And she shed one perfect tear on his scarred cheek, and nodded. His cathars all wore masks. The filigreed visage of Vronos was always first among the dread hunters. The monsters and the ignorant called him the Gray Fencer, although he had as little in common with the elegant sport as they did. But he obliged his reputation, thrusting his fine blade through the heart of each fallen enemy of the good. He understood finally why his sister had to die. He did not forgive, but he saw the need. Combatting evil meant hardening the heart. The hunter cannot pity. One morning, a warrior angel appeared. She spread her shining wings over Vronos and raised high her sword. "I carry a message for the masked one from my Lady, a task only her most devoted servant can perform. It will be the most perilous quest of all. Complete this charge, she says, and he will be counted well quit of his debts." 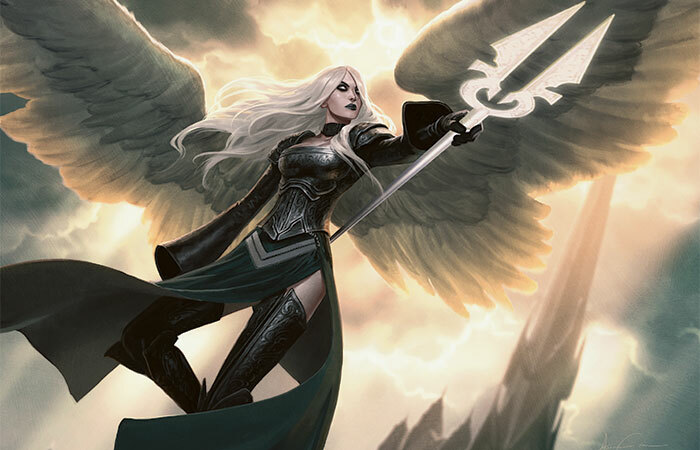 Avacyn floated in the high ceilings of her cathedral like a new sun in the heavens. Vronos could not look directly at her glory. He bowed low. "What service would you have of me, Lady? I am yours to command." "My loyal hunter. I wish it were not necessary to call on you for such a task, but only you, among all my followers, have the skills to perform it." "I swore an oath to you, even unto death. I hold to it still. Name your charge." Sadness shadowed the angel's words. "The force that freed me also unleashed greater evil on the world. Many demons were imprisoned in the Helvault. Had I the choice, I would rather have remained within than escape and release them. The dark one who caused the prison to open has laid a blight on this world, but I and my Flights, and our faithful, will cleanse it. "Worse is the curse she has inflicted on one who, like you, can travel between the worlds. Left untreated, this affliction will transform him into a demon beyond any other—and beyond my reach. "But you, my chosen, can pursue him as my other servants cannot. You must find this man, Garruk, and bring him to my cathedral. I doubt that his condition allows him to understand his plight. If he will not come willingly, you must bind him. You will need all your cleverness and learning to overcome his cursed might. "Do this for me, and for the many worlds at stake, and I will count you free of your oath to me." Vronos stood and forced his eyes to behold her. "My Lady, even if I were not sworn, I would do all in my power to serve you. I will undertake this task, not to be free, but to carry out your purifying work wherever it needs to be done." Around Avacyn a host of angels appeared, singing in bell-like tones. The cathedral's dim vaults burst into bright day, hurling a long, sharp-edged shadow before Vronos as he strode through the carved doors. The man, Garruk, scarcely resembled anything human. He was a huge mass of muscle, rank with sweat and old blood. His face was concealed by a scarred, rusty helm and a coarse mat of hair. The stink of corruption soiled the air as he raised his immense axe. "Hold, accursed one!" Vronos cried. "You have been tainted by an evil you do not comprehend. Lower your weapon and let me bring you to the healers of Avacyn." The brute roared like a beast and swung his axe. 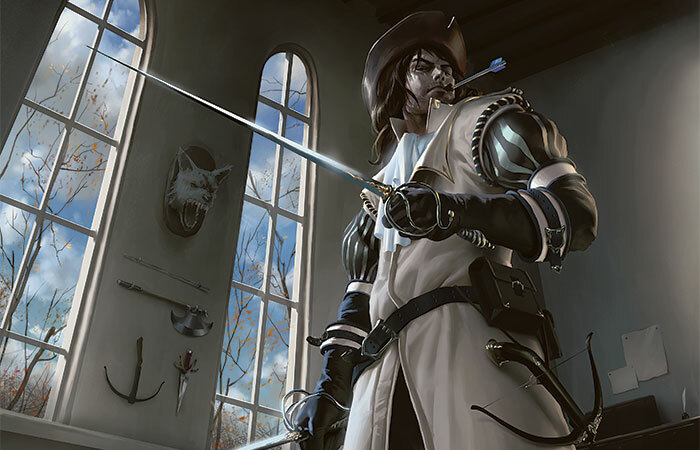 Vronos stepped back, not daring to parry the heavy blade with his slim rapier. He raised his crossbow and murmured a charm of subdual over the bolt as it flew. Garruk simply smashed it from the air. With a throwing motion, he brought into existence a snarling bear. It leaped at Vronos, who quickly crafted a shining morningstar and bashed the beast. Panting with exertion, he summoned up a metal monster of his own. As more wild creatures joined the fray, Vronos responded with etherium servants. 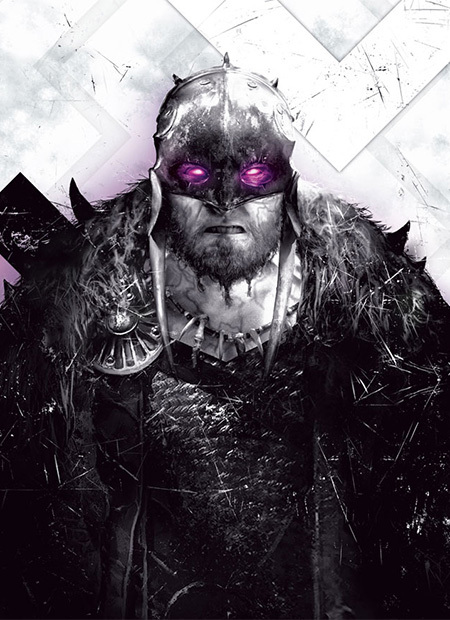 But Garruk grew even larger and more ferocious in the full fury of his defiled nature magic. Vronos could craft new defenders from the scraps of those that fell, but he knew he was falling behind in this match. Vronos raised his hands in a desperate incantation. But before he could finish the words, the axe head buried itself in his shoulder. Garruk had simply hurled his weapon. Vronos dropped to his knees, clutching the bleeding wound. It would prove mortal without quick attention. He fled into the void, his enemy howling curses behind him. He arrived at the mouth of a cave where he had once sheltered. Its bedding of branches, leaves, and grass was still undisturbed. Vronos crawled into the welcome space and felt for the cache of herbs. His hands closed on the dried leaves, and he muttered a brief prayer of thanks. He quickly chewed them into a poultice and smeared it into the wound. He fell back and let the darkness take him. Vronos had been too dependent on the Inquisition clerics, he then saw. Once he regained some strength, he would need to return to the shrine; the wound was beyond his ability to repair completely. And he would spend some time learning the basics of battlefield healing before he faced the monstrous Garruk again. But for the time, he needed to rest and allow his body to recover. And that required nourishment. Water would not be difficult to get, but he could scarcely spare the energy even to scrounge up a few berries. He drifted in and out of consciousness, the pain in his chest throbbing in time with his heartbeat. The sun set. The air turned blue. A thrush's notes cascaded through the quiet dusk. And then, a doe stepped into the glade not a hundred feet away. She was dappled with starlight. Her eyes were dark and liquid, reflecting the moon as she raised her head to snuff the breeze. She was beautiful and innocent. But the hunter cannot pity. Vronos slowly raised his crossbow. The doe started, ears swiveling. The bolt flew true. It sank into her neck, even as she turned to flee. A few thudding steps, and she was down. The light faded from her eyes, becoming black glass. Vronos dragged himself, moaning, toward the fallen forest creature. Hours seemed to pass before he drew even with the doe's corpse. He offered another prayer of thanks and pulled the bolt from her still-warm flesh. A sudden snap of twigs, a heavy tread. Vronos looked up, and saw the moon blotted out by a hulking figure. Two sullen purple lights glowered from the monster's helm. It hefted its axe. "I said you could not hide from me." The axe whistled down. Vronos bowed his head.